Keep all Data intact during Repair Process like: sent/receive date, to, bcc, cc and attachment etc. Fix Outlook Numeric and Non-numeric Errors like: 2GB oversized issue, Outlook pst is not a personal folders file, Outlook error 0x800ccc0f or 0x800ccc0e etc. Salient Features of Outstanding Software to Recover PST files! Outlook PST Recovery is capable to fix all types of Outlook errors which caused due to following issues like oversized 2GB file size, mistakenly deleting items, corruption due to virus, add-ins, etc. It works on the damaged PST file and maintains the hierarchy of data without harming a single bit of data. 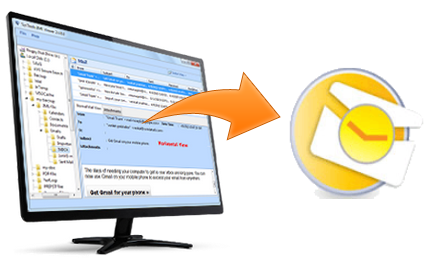 Recovery of lost Outlook emails is also possible with the help of this software. This software provides two scanning modes for recovering Outlook data file (PST): Advance Scan Mode & Quick Scan Mode. However, with the upgraded versions of Outlook Recovery, Quick Scan Mode has been removed from the software panel and made it available as a default. On the other hand, Advance Scan Mode still dig out the complicated bugs of the Outlook Data file. It can swiftly recover entire Outlook data like emails, attachments, tasks, contacts, journals, calendars, notes, etc. and retains the data (folder) structure intact as it was. Once the tool completes its scanning process and renders the recovered data in a concise manner, then a user can enforce multiple features to deal with repaired data further. EML or MSG: When a user chooses one of these options, he/she gets two more advanced features as mail filter and naming convention. PST: These options get activated when a user select PST file format to export. Mail filter and Split PST gives privilege to users for better data management (especially, the SPLIT PST). Mail Filter: This option helps in recovering mail of stipulated time period and only recovers the data which comes under the defined time interval. Split PST: Split large sized PST file into smaller segment by enabling this option which makes PST file less prone to corruption in future. Naming Convention: It provides eight different structures to save restored email messages. 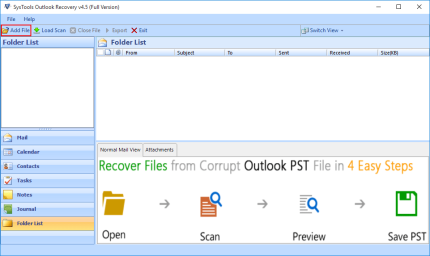 Outlook PST Recovery Software is compatible with all editions of Windows operating system and also with all versions of Microsoft Outlook like 2013, 2010, 2007, 2003, etc. This application has been passed through various development cycles, so it could be proven compatible for almost every operating environment, especially for which it is designed. Steps for Outlook PST Recovery – Get it Here! To start the process, browse location of corrupt or damages PST files from your system. Software starts Auto scanning of corrupt PST files immediately after selecting broken PST from Outlook. Get preview of recovered PST files that you save at specified location with no data loss. 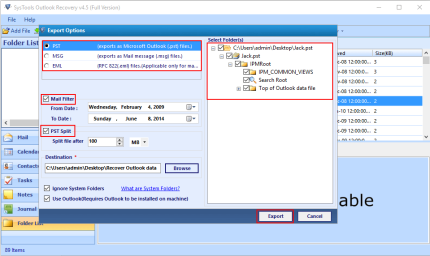 Get FREE version in order to check the working & specification of Outlook PST Recovery tool. As it gives an aureate change to learn more about tool at No cost, it repair 25 items per folder & complete preview of recovered items. Have a Look – PST Recovery Screencast! Online Video for Free Tutorial on How to Recover PST!! Learn how to recover and repair PST files using Outlook Repair tool with the help of given video. This short duration video will present entire process of software with each and every feature explored briefly. Once the entire process of PST recovery files is viewed, you can invest money on the full version of software. So, Watch FREE online video and know how software actually works. Copyright © 2008-2019| www.pstmerge.com | All Rights Reserved.